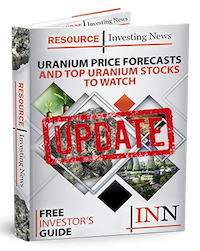 What are the best uranium stocks? We’ve compiled a list of companies on the TSX, TSXV and ASX that have seen year-on-year share price gains. Despite U308 prices remaining flat during Q1 2018, the second quarter of year proved to be more lucrative for uranium investors. The spot price for uranium grew roughly 15 percent, from an April low of US$20.50 per pound to a mid-June high of US$23.40. The price gain is likely a result of decreased production in Kazakhstan, one of the world’s top producers. Restarts at eight of Japan’s shuttered nuclear reactors is also a factor behind the uptick in uranium spot price, according to expert investor Mickey Fulp of Mercenary Geologist. “This jump in stock prices was really stimulated by 600,000 pound buy on the spot market by the utilities,” he added. Like many well-known uranium commentators, Fulp remains optimistic that growing demand and a limited supply will drive prices higher creating a uranium boom. During Q2, a number of uranium-focused companies experienced share price gains, benefiting from increased demand in Asian countries. Of the TSX, TSXV and ASX stocks that performed well during the second quarter of 2018, these companies saw the largest year-to-date growth. All figures are accurate as of July 9, 2018. If we missed a uranium mining or exploration company you think should be included, please let us know in the comments. All companies listed had market caps of at least $15 million at the time of publication. Australia’s Energy Metals is a uranium-focused exploration company with eight projects spanning the Northern Territory and Western Australia. These include Bigrlyi, Ngalia Regional and Macallan in the Northern Territory, as well as Lakeside, Anketell, Mopoke Well, Manyingee and Lake Mason in Western Australia. All of these projects are 100-percent owned by Energy Metals, except for Bigrlyi, in which the firm has a 53-percent stake. Bigrlyi is jointly owned with Northern Territory Uranium and Southern Cross Exploration (ASX:SXX), although Energy Metals manages the project. On April 30, the company published its quarterly activities report, which included its upcoming plans for the year. At its Bigrlyi joint venture, Energy Metals is planning for a prefeasibility study and re-optimisation studies in 2018-2019. Meanwhile, the company has implemented a tenement reorganization plan at its Ngalia regional project to focus exploration efforts on most prospective grounds. Plateau Energy Metals is a Canadian uranium and lithium exploration and development company focused on its properties on the Macusani Plateau in southeastern Peru. Plateau Energy currently controls all reported uranium resources in the South American nation. During Q2, Plateau spent a great deal of time advancing its various lithium projects. In late May, the company completed a non-brokered private placement, which raised C$2.5 million. Presently, Plateau is looking for a new CEO and interviewing prospective candidates. Australia-based Boss Resources is an exploration and production company engaged in the development of the its Honeymoon uranium project located in south Australia. The company purchased the site in 2015 and has spent the last three years preparing the project for production. According to Boss, Honeymoon is positioned to be Australia’s next top producer, with potential to add up to 3.2 million pounds of uranium per year to the market. Boss is also an oil and gas exploration company. In June, the company released its investor presentation, which included an overview of the Honeymoon project. One of the highlights of the report was the annual uranium export license of 3.3 million pounds, which the company has already secured. At the beginning of July, Boss announced its detailed strategy to restart Honeymoon. The three-phase process will begin with phase one, which is already underway. The company hopes to initiate phase two of the restart process in early 2019. Energy Fuels is a Colorado-based uranium mining company, supplying uranium to major nuclear energy suppliers. The company owns three uranium production facilities: the White Mesa Mill in Utah, the Nichols Ranch processing facility in Wyoming, and the Alta Mesa project in Texas, with a total annual production of 11.5 million pounds. Energy Fuels also produces vanadium as a by-product. During the early part of Q2, Energy Fuels sold off non-core uranium properties in Wyoming, adding US$5.39 million to its balance sheet. Later in the quarter, the company was added to the broad-market Russell 3000 Index, an index widely used by investment managers and strategists as it lists the 4,000 largest US stocks. In late June, Energy Fuels strengthened its cash position by US$16 million through an at-the-market (ATM) program. Canadian headquartered Cameco is considered one of the world’s largest uranium producers, accounting for roughly 16 percent of global production from its operations in Canada and Kazakhstan. According to the company, it owns approximately 458 million pounds of proven and probable reserves. In late April, Cameco was awarded a C$62 million contract to manufacture calandria tubes and annulus spacers for Ontario’s Bruce Power, as part of the provincial energy providers major component replacement. In mid-May Cameco announced the election of 10 board members. What do you think about uranium-mining companies, prices and whether to invest now or later? Let us know in the comments below. Editorial Disclosure: Plateau Energy Metals and Energy Fuels are clients of the Investing News Network. This article is not paid-for content.